That spring Madge was back on the road. A social commitment in Dallas allowed a road trip through Mississippi. The plan: spend a couple of days in Scooba plus do some archival research in Jackson. It was finally time to try to put the pieces together on grandmother Madge’s Hat Shop in Scooba. Base Camp was Meridian, Mississippi three hours west of Atlanta with a reservation at the Drury Inn. Upon check in Madge was upgraded and she took as a good sign. 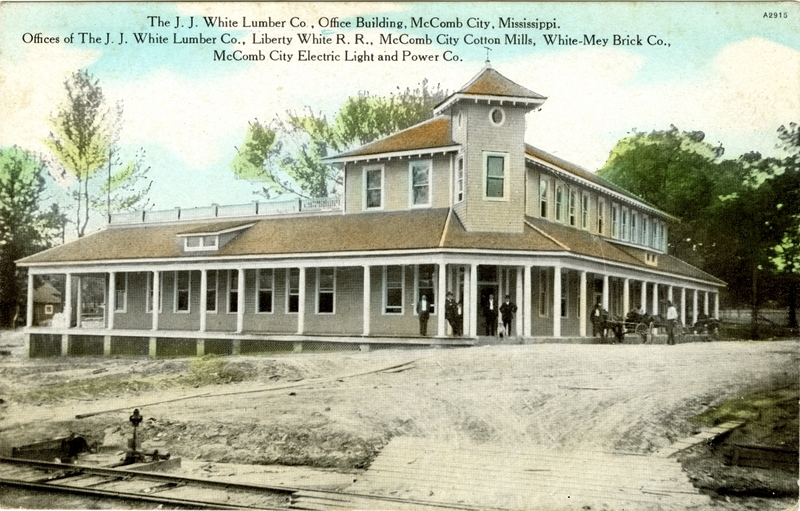 Meridian was once the largest city in Mississippi and a major railroad town. It still has a wonderfully intact historic downtown that includes a restored movie palace and even a skyscraper. The Temple Theater, built in the 1920s by the Shriners has a Moorish theme and is now a performing arts center. The skyscraper, The Three Foot Building, is a magnificent example of Art Deco. It’s unique name comes from the original building owner who Americanized Dreyfuss (“three foot” in German). Unfortunately the building now stands empty but could be a real economic generator for the city as a hotel or apartments. After unpacking it was back on the road north to Scooba, a 45 minute drive. 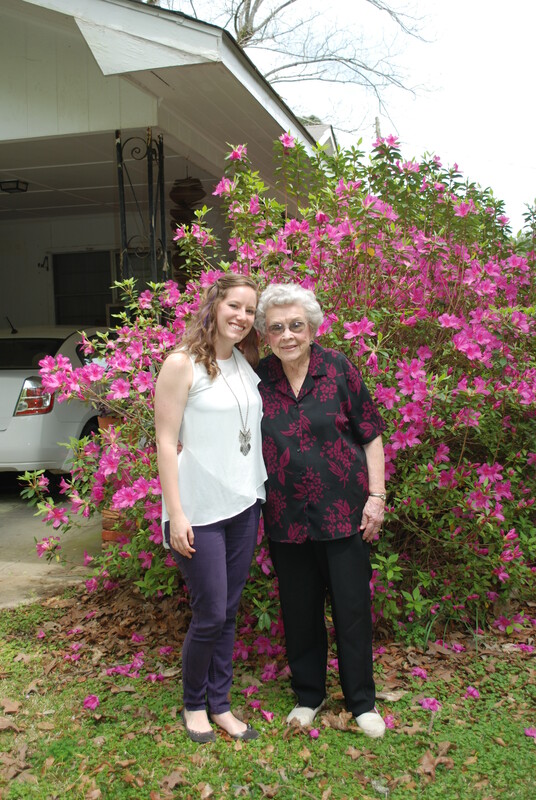 Madge was reconnecting with her favorite librarian, Sarah, at East Mississippi Community College. I was reconnecting with my favorite librarian, Sarah, East Mississippi Community College. On my previous trip she was instrumental in researching the Hat Shop mystery. Our agenda for the afternoon? Check out the new downtown museum, meet with the family of one of the downtown shop owners and then on to the historic cemetery. After picking up Sarah at the library we cruised through downtown Scooba, which on the surface hadn’t changed. However, per Sarah’s update, a group of hard working locals have made some important progress. A new museum/community gathering place has been set up in one of the remaining buildings. When we arrived, we found Leonardo was busily working in the back of the building, now called The Whistle Stop, getting his new barbecue restaurant up and running. In the front there’s an area for a small museum of local artifacts including shoes purported to be worn by The Hairy Man, Scooba’s take on Yeti. (Apparently generations of local parents have kept their children in line with tales of a giant hairy man out in the forest). Everything was a bit jumbled due to the renovations, but Sarah has promised some photos once the restaurant is finished and the museum is back in order. There is also an area where the quilting club meets, and a local Mennonite lady sells baked goods on Friday morning. Small steps, but any new life downtown is a good thing. Next it was on to meet up with Sue and John and their niece Linda. Sue grew up in Scooba and her father had a seamstress/tailoring shop in downtown. John, once a high school football hero, is a community leader. We had a wonderful conversation about the old downtown and its once majestic train depot, now unfortunately a grassy lot. I also learned that there once was another row of shops on the other side of the street but after several fires in the early 1900s, those storefronts had never been rebuilt. John had a theory on where the girlfriend photo might have been taken. At the far end of downtown there was a middle area where he thought the gazebo in the photo was once located. We had a grand time with John, Sue and Linda hearing more Scooba stories, but still no photos. Where are those elusive photos of downtown Scooba in its glory years? From there Sarah and I headed over to the historic old cemetery to take a look. Madge’s stash of letters from Mae Hare, the Scooba girlfriend, were fun and chatty about the goings-on of their crowd. Many of those names were now laid to rest in this cemetery. Leon Quarles, Bunny Rosenbaum and some Hares, but no Mae. Afterwards it was back to Meridian, darn, missed the Drury happy hour, but later met Sarah and her husband in downtown Meridian at Weidmann’s, a local institution since 1870. We had a marvelous dinner and a well earned bottle of wine. The next morning it was off again to Scooba and the home of Miss Thelma with bags full of lunch from Weidmann’s. During my first trip to Scooba Sarah had told me about Miss Thelma, custodian of all things Scooba and who was born in 1918, the year after grandmother Madge was there. 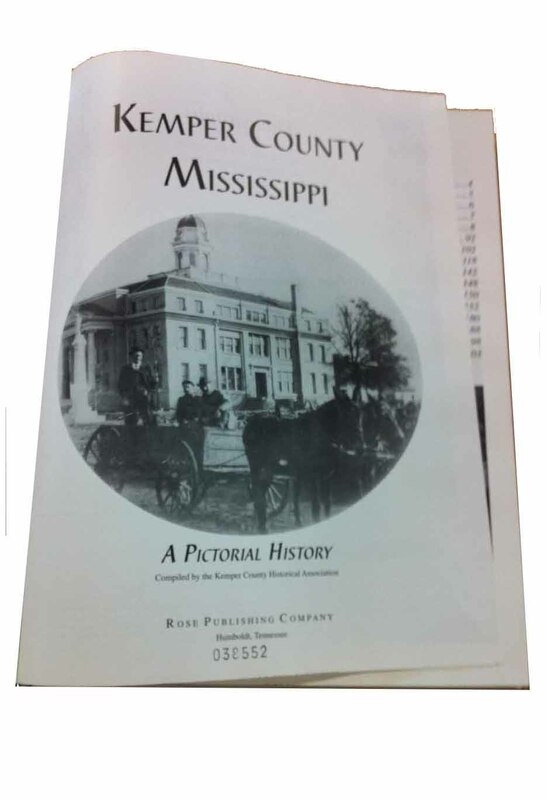 She has written a Scooba history, a family history, and was instrumental in getting the Pictorial History of Kemper County published. (I really need to find a copy of that book.) She is also a newspaper columnist for the Kemper Messenger and now at 95, is working on a cookbook with all of her famous recipes. Miss Thelma is an amazing woman. At 95 she still lives in her comfy house, drives all over the place and cans an amazing quantity and variety of vegetables every summer. 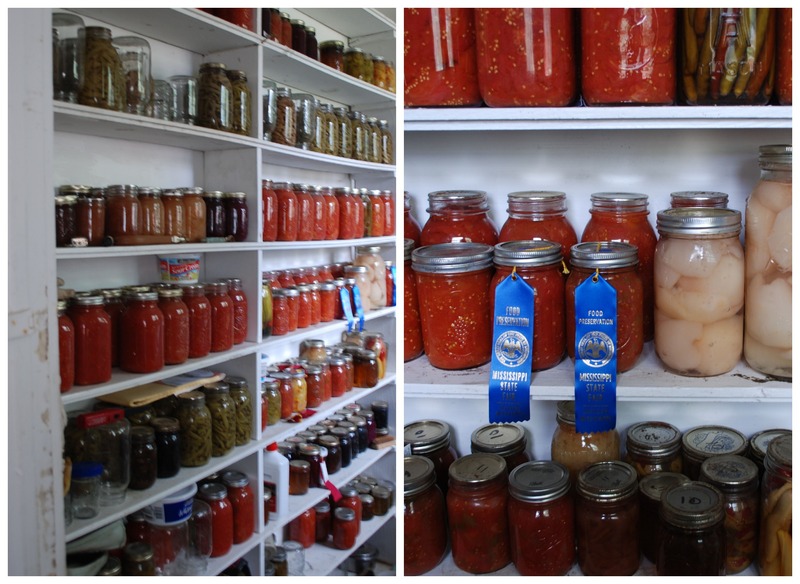 The jars of tomatoes, pickles and green beans in her shed are a thing of beauty. Sarah is eager to have Miss Thelma show her the secrets of canning. While it may sound old fashioned, canning your garden vegetables is a handy skill to master for folks who live in Scooba and other small towns with no stores close at hand. Of course we talked for hours over fried green tomatoes, field peas, macaroni and cheese and a local specialty, Creole cabbage. Miss Thelma had a big old pitcher of tea at hand and an apple pie baked just for us. While Miss Thelma could not have known grandmother Madge, she was well acquainted with many of the folks mentioned in Mae’s letters. Miss T has files upon files of local history and lore. We went through dozens of old photos, newspaper clippings and heard some fascinating stories about Miss Thelma’s aunt, who was a legendary schoolteacher and the local puller-of-teeth for hundreds of school children. I could see why everyone I met in Scooba said, “Talk to Miss Thelma”. Miss T has also written a history of nearby Electric Mills, established in 1913 as a self-contained lumber mill and company town and one of the first communities in the United States to be completely powered by electricity. 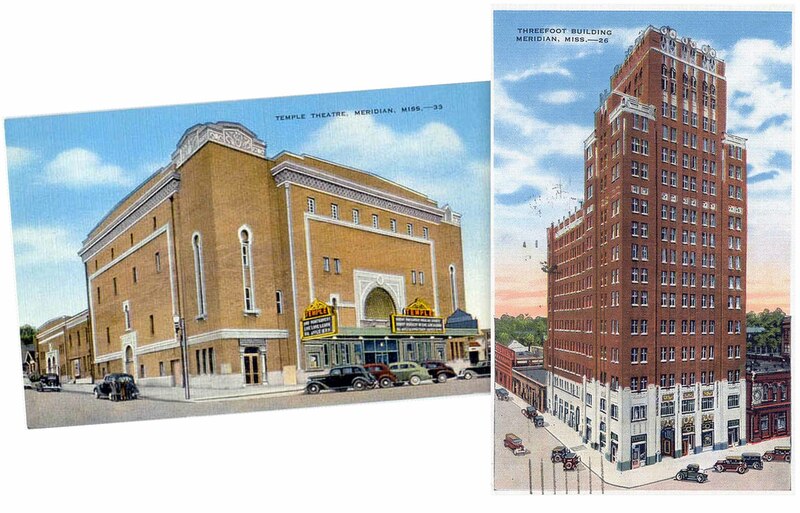 A very lively place in Mae’s letters, it once had a hospital, theater and even a baseball team. But by 1941 it was all gone. After the last trees were cut, the lights went out. You can read her column on Electric Mills in the Kemper County Messenger. Of course Mother Nature has a habit of getting the last laugh and what was Electric Mills is now once again covered with beautiful trees. By then it was late in the afternoon and we had purposely scheduled a meeting at the historical museum in nearby DeKalb so we wouldn’t tire out Miss Thelma. Boy did we get that wrong. It’s not possible to tire her out. The entire time we were there she was up and down, retrieving photos, drinks and pie, plus answering a phone that was constantly ringing with news from friends and family. Whew! Well we were already late, so Sarah and I made our apologies and promised to come back the next day. For now it was off to DeKalb; but not before scoring scored a jar of those tomatoes, some pepper jelly and that award winning chili sauce. Thanks Miss T! 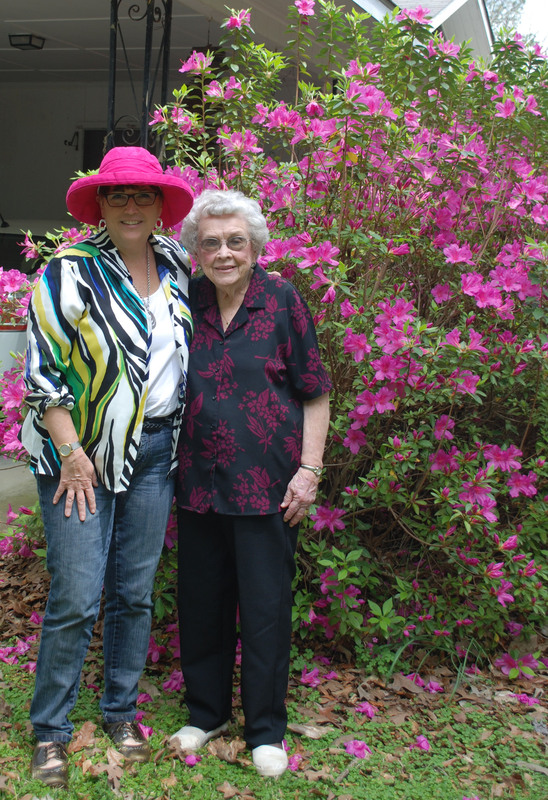 Madge & Thelma in front of her beautiful azaleas. Another wonderful update. You have become quite the Sherlock Holmes, Madge. The mysteries of the Hat Shop shall reveal themselves at some point, and you will have the whole story. THEN it shall be time for you to consider an ebook of this adventure into millinery, thru the back door of Madge’s Hat Shop. Keep going, waiting with baited breathe. I just love this unfolding story! !